« Can urban homesteading really be a solution to poverty? Zombie June Cleaver: Do We Really Want to be 1950s Housewives? Just came across this piece on Slate’s Double X, tearing apart an (admittedly pretty annoying) Salt Lake Tribune piece on women “embracing a more traditional lifestyle.” The writer, Amanda Marcotte, objects to the way the story suggests that women want a genuine return to 1950s housewivery. 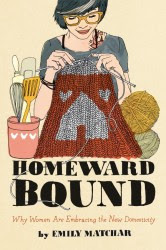 Stories about the “return to domesticity” among educated young women do tend to drag out the zombie corpse of the 1950s Happy Homemaker, dust her off, and say, “see, women just want a return to tradition.” And it’s easy to knock this Zombie Housewife down, as Marcotte handily does: few modern-day women would claim to actually want to live in the 1950s, an era where women literally couldn’t open a bank account without their husband’s permission. But slaying the myth that women want to be June Cleaver all over again shouldn’t mean ignoring the realities of what women DO want: the study cited in the Salt Lake Tribune says that 66% of mothers would prefer to be stay-at-home parents than employees (as would 36% of dads!). Young people (women AND men) DO feel a greater pull towards home than their parents did – Gen X and Gen Y are significantly more likely to rate themselves as “family-centric” than are Baby Boomers, who are more likely than younger generations to rate themselves as work-centric. Women’s work centric-ness has dropped particularly dramatically in recent years. In 1992, 57% of women wanted jobs with more responsibility. A decade later, only 36% wanted more responsibility. Men’s desire for more responsibility dropped too, from 68% to 51%. This isn’t surprising, given that people are working harder than ever for stagnant wages and decreased opportunities. While “opting out” among educated women is a real phenomenon (at Harvard, my alma mater, about 22% percent of female graduates will no longer be working by age 37, while many others will only be working part-time), the reasons for leaving the workforce are rarely a question of “I’d rather be vacuuming the carpet in pearls and high heels.” Studies suggest that professional women leave the workforce for complex reasons, including anti-mother discrimination and lack of childcare options. Yet the media typically ignores these issues in favor of the “I just luuurve being with my kids 24/7″ narrative (check out this fascinating report for a breakdown of how the media reports on the opt-out phenomenon). We don’t want to be June Cleaver, we just don’t want to be briefcase-toting “company man” Ward Cleaver either. The “return to domesticity” may be real, but we need to look at it as an economic and workplace phenomenon rather than simply suggesting that women literally want to return to the 1950s. …On a side note: I think I know what my Halloween costume will be this year! 1 comment to Zombie June Cleaver: Do We Really Want to be 1950s Housewives? I am an opt out woman (54) I finally am able to be a homemaker which is what I have always wanted to be. I am the june cleaver with out the heel and pearls. I have never been happier than I am now….women give yourself a chance and watch your husband turn to you with more love and respect for you. I love my life for the first time. I am learning to can, I am sewing and learning to crochet. I get up at 5:30 am and fix my husband breakfast and pack a lunch. I have a regular routine ( my life is more freeing than ever before.